Mahindra opens Exclusive MOJO dealership in Bengaluru Mahindra Mojo exclusive dealership was launched today in Bengaluru. 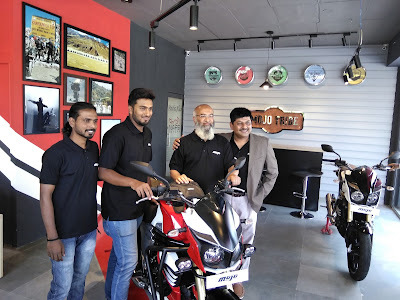 This exclusive Mahindra Mojo dealership is located in Banaswadi of Bengaluru. NAFS Motors, the exclusive Mahindra Mojo dealership is located at 100 feet Road, Doddabanaswadi, Bengaluru. This is a first of its kind two-wheeler brand specific dealership in the country. The company had also announced that they are working on an adventure, street and cruiser models based on the Mojo platform. With 4 new models confirmed to join the Mojo family; prime contenders being production versions of the Scrambler and Adventure version displayed at the 2016 Auto Expo. A low-cost version with standard telescopic forks and a single sided exhaust too is on the cards! Launched in 2015, the Mojo currently retails at Rs. 1.70 lakh (ex-showroom, Delhi). The move to separate the Mahindra Mojo from the rest of the line-up, which includes products like the Centuro and Gusto, is to add value for buyers paying this premium price by offering more exclusive experience and premium treatment.